Chronic is a hybrid feminized Marijuana strain, the most commercial one from Serious Seeds. A super-yielder with manageable characteristics having a sweet aroma and taste. Chronic is a hybrid feminized Marijuana strain, the most commercial one from Serious Seeds. 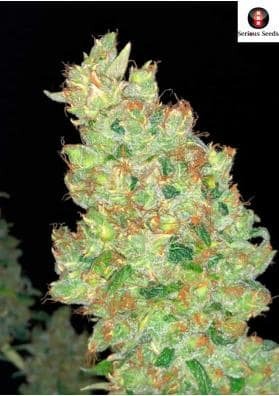 Is a plant able to combine outstanding yields with high quality thus being one of the favorite choices of commercial growers all around the world. The plant reaches a moderate height developing a huge central stem with only lateral branches. Do not cut the main stem in this strain, because there is where the formation of buds is concentrated. If you care for it will produce buds with a delicious sweet aroma, one of its most known characteristics. In order to keep its fragrance and taste it is necessary to dry the Marijuana before storing it. If everything goes well, in only 55-63 days it will be able to offer you around 600g per square meter indoors. You can harvest it in mid-late October if the plants are cultivated in the garden. It will surprise you with its great power and high qualities, a hybrid effect that will not let you down. In this way, Chronic is the perfect option if you are looking for high productions without sacrificing the quality of your weed.